The goal of the game is to find your partner with the matching color. Your inner color is only visible within the safe spaces. This game was made for Rainbow Jam 2018. Space: Jump. You may only jump easily within safe spaces. 'q' + 'p' + Space: Jump. If you are outside of the safe spaces, it is more difficult to jump, although it is sometimes required. I thought this concept was very clever. 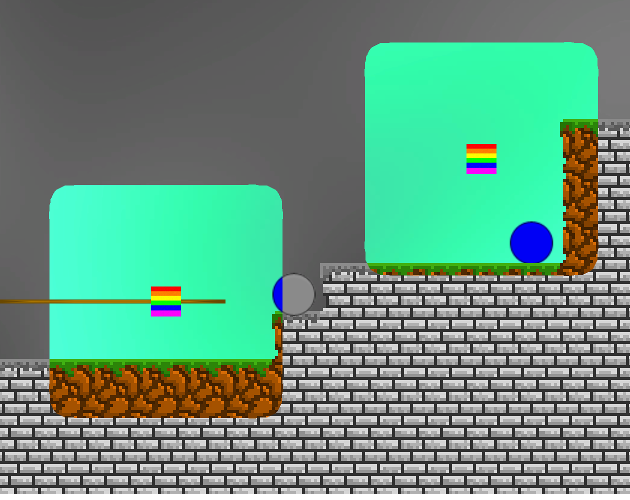 I liked your use of colour and the way you developed the levels throughout the game. I love the rhetoric here. Made me think of safe spaces IRL and how volatile they actually are. I personally feel like I'm in a safe embassy when I see a rainbow flag, so this game really made me think a lot about how a safe space is not just its physical location but the way we allow ourselves to be in it.